A Digital Agency Veteran, who has worked on both sides of the boardroom table (as Client and Agency), and has experience in 2 multi-national organizations, and has been a speaker is a few pretty fantastic international locations during the past 10 years. William has gone back into the entrepreneurial and Business Start Up world to consult on digital marketing, social media marketing and online strategy. This 3rd Start Up will be one of the most exciting yet and he aims to implement some of the business and agency learning and experience to make a macro impact as a MicroAgency. William is considered to be a travel destination marketing specialist – with a specific spin on the digital, social and online spheres. He is also considered to be an expert and social media marketing and calls himself an online junky with more than 20 years digital experience. He has worked in some of the largest and most successful South African Digital Agencies, and also successfully co-found and operated two Agencies of his own, with Mqondisi Gumede. 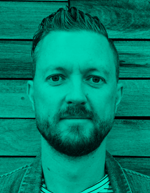 Most recently as Head of New Business Development at Fogg.Agency, a boutique integrated full service digital agency where he worked with the team on key accounts including African Bank, Eskom, Cape Town Tourism and Bonitas. Before that as co-founder of Man&Machine, a Brand and Strategy Agency before joining Fogg. Prior to Man&Machine, William was At South African Tourism for 7 years as the Global Manager: Digital. There William was responsible for all the digital, online and social activities for SA Tourism across the various territories and markets, working with multiple agencies across various time zones and in different languages. William grew the digital marketing budget from less than 4% when he started, and grew the spend to more than 35% with a team of more than 10 staff becoming the second largest business unit in the business. William is passionate about travel, technology and digital – he has been asked to speak a numerous marketing, travel technology and digital transformation events, and loves to explore the possibilities that technology, digital and social have to offer that will truly disrupt our lives and way of work.